We use Gratuities as an umbrella term for both Service Charges and Tips. Service Charges are discretionary charges applied by the EPoS to a customer’s bill, so they produce an extra charge on the bill that is paid. As they are technically discretionary (they can be removed if the customer requests it), these are not subject to taxes such as VAT. Tips are overpayments made by a customer beyond the requested amount on a bill. These may be taken as both cash or on card (PDQ). Kobas EPoS needs to know about service charges that can be applied to tabs. 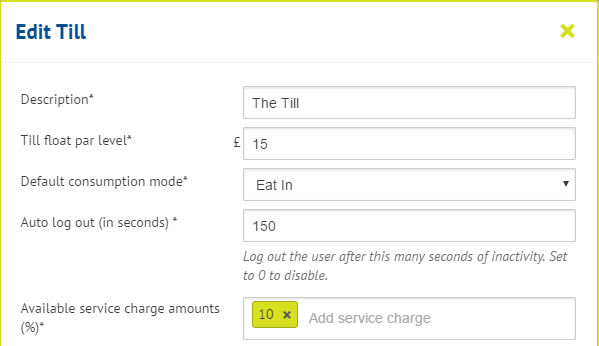 This can be as simple as saying “let all staff choose whether to put a 10% service charge on any tab” through enforcing a 12.5% service charge on all tabs, to permitting percentage charges in different venues, or even at different tills within venues. You could even offer different gratuity rates so your staff can choose between say 10%, 12.5% and 15%, or a combination of everything mentioned so far if you need to get that advanced. Kobas EPoS automatically logs overpayments by card (PDQ), but assumes any cash overpayments will be returned as change. Cash tips should therefore be stored separately and declared in the Cash Declaration in Closing Tasks at the end of the night on Kobas Cloud. Once that’s done, declared gratuities will automatically be distributed among staff based on their hours worked on the days the gratuities were accumulated. You can redistribute the Tronc to favour certain members of the team. See our help guide on Tronc Weighting for more information.